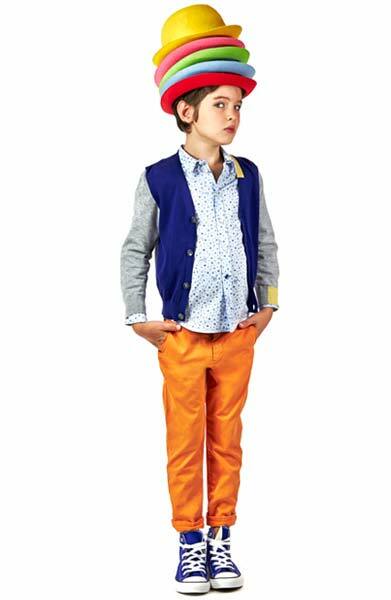 Check out this fun, bright colored outfit from the Paul Smith Junior Boys Spring Summer Collection. Perfect for any boy going to a casual party or day or night out on the town. This cool orange and blue a layered look, complete with a royal blue cardigan, makes it a great outfit for cooler Spring days and Summer nights. 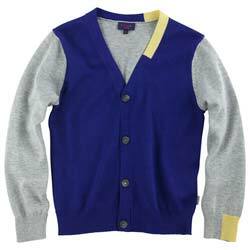 You can shop this adorable Paul Smith Junior Look from boys ages 3-16 years old. All photos and content provided by our sponsor Melijoe. Royal blue front and marl grey back. V neck. Long sleeves. Light yellow ribbed neckline and left cuff. 100% Cotton. 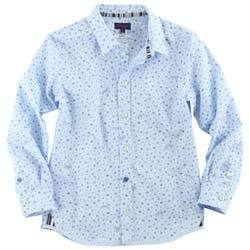 Sky blue printed shirt made of cotton percale. Signature stripes inside the collar. Long sleeves. 100% Cotton. 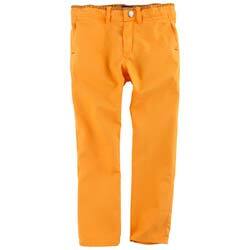 Bright orange trousers made of cotton cloth. Zip fly and popper fastening at the waistband. Embroidered monogram on the side. Sizes 3-16 years. If I were a boy…I would wear these fun Paul Smith Junior boys shirts every day of the week! I love bright colorful boys shirts that bring a bit of fun and character into children’s wardrobes. I’ve always admired designer Paul Smith’s striped shirts for men and love how he brings the same color schemes into his Paul Smith Junior’s children’s collection. 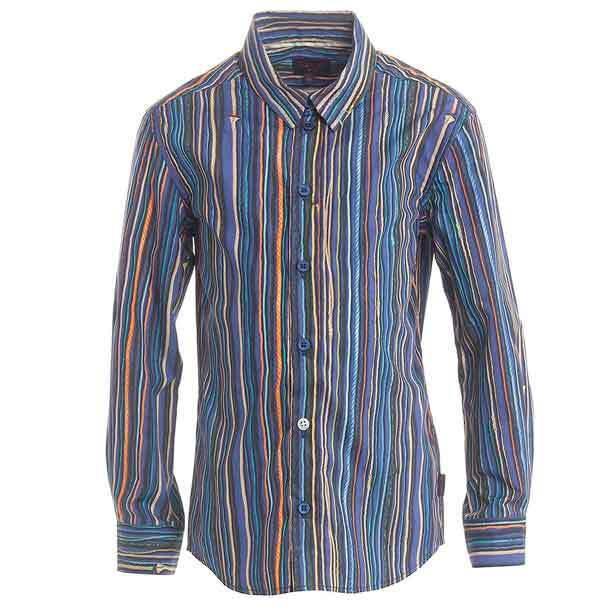 Take for example this colorful long-sleeved Boys Rope Print Shirt by Paul Smith Junior. 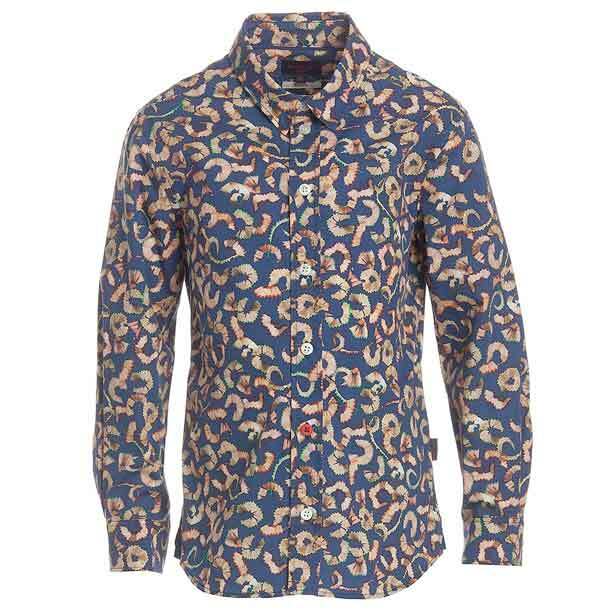 This navy blue classic shirt has an unusual twist with its multicolored rope print pattern. Another signature Paul Smith touch is the blue buttons on the front with one white button at the bottom. Now here’s a creative print that is truly unique, brightly colored pencil shavings that give this cool shirt a stylish twist. Made from lightweight cotton this boys navy blue slim fit shirt includes white buttons and the unique red button second to the bottom. 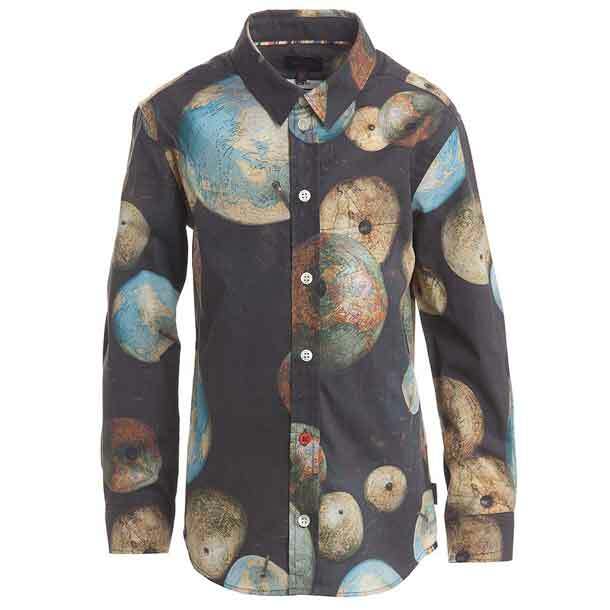 Ok, here’s my favorite Paul Smith Junior boys shirt, this dark grey classic cotton shirt with colorful old world style globes. Yes, it also has white buttons, with one unique red button on the bottom. Now here’s a way to keep track of what day it is! 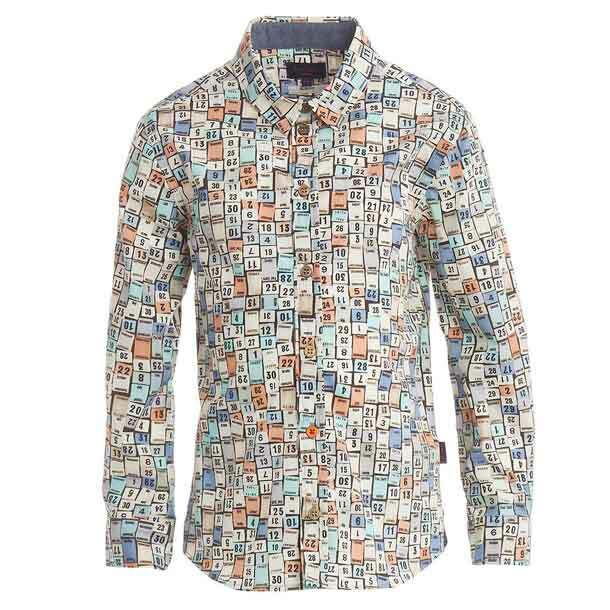 This long-sleeved cotton shirt by Paul Smith Junior is covered in a striking multicolored calendar print. This time the buttons are in brown with one contrasting orange button second to the bottom.